There is a bewildering range of pool equipment to go with your new pool. From heating to robotic vacuum cleaners, the array of technology options to perform similar functions can be overwhelming. We advise clients of our reasoning and brand choice behind each recommendation as it can get a little confusing for new pool buyers. Always choose pool equipment that will match the pool you will be constructing and ask for as much information as you can about this equipment from your designer. Our detailed proposals explain the features and benefits behind each equipment option we recommend. We encourage customers to ask questions about our recommendations and the alternatives available. Media Filters (sand, glass, zeolite, diatomaceous earth). We could write for pages on the pros and cons of the various filter media. Needless to say we will recommend the right media to ensure your pool is as low maintenance and energy efficient as possible. Sand and diatomaceous earth filters are waning in popularity as they require more frequent back-washing to waste (thus using more water) as well as more regular replacement (Approx. 5 years). Recycled glass is gaining in popularity as it requires less back-washing and rinsing and can, in theory, be used for ten years or more. Cartridge filters – popular in vinyl clad, small pools and spas but are also ideal for situations where water consumption is an issue as they don’t send high pressure water to waste in the process of flushing (back-washing) like a media filter must. For example, the Viron (Austral) CL Cartridge Filter is one of the most effective ways of filtering particles and debris from your swimming pool or spa. 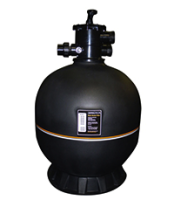 The Viron cartridge filter has the added benefit of requiring minimal maintenance by reducing the need to clean the elements and can save between 7,000 to 12,000 litres of water per year. Cartridge filters are consumables, requiring periodic cleaning and eventual replacement. 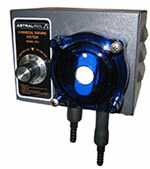 We use and recommend Astral pool pumps, Australian made and engineered for reliability and energy efficiency. We also recommend Hurlcon, again chosen for Australian made quality and reliability. Most Viron and Hurlcon pumps we specify have built in features such as variable speed settings, multi stage time scheduling. The best performers for quietness and energy efficiency. Crystal Pools currently specifies Hurlcon and Viron products for automated and semi-automated chemical dosing as well as salt water electrolysis conversion to chlorine. Salt water chlorinators – this technology will create its own chlorine whilst the filter is operating by using electrolysis to convert sodium chloride (salt) into chlorine. Chlorine or bromine dosing – sanitises against bacteria and algae. Dosage should be applied in measured amounts according to demand (organic load) on pool. Automated Chlorine dosing – automatically tests your pool water and administers the precise amount of sanitiser required. Saves on overdosing and lessens the need to shock pool due to sanitiser levels falling too low. Ionising systems – use a low voltage current across copper and silver bars. The Greeks knew that water kept in copper pots (or with silver coins) remained pure and wasn’t susceptible to algae growth. Silver ions act as a disinfectant and copper ions kill algae. However an ionised pool still requires an oxidiser for effective sanitation so most manufacturers recommend chlorine. Ozone generation systems to most people’s surprise have actually been around for many years and are one of the most effective disinfectant / oxidisers on the market – used more often in commercial situations overseas. Smaller domestic version are becoming available as the technology improves. Ozone is created from oxygen via one of three methods. Unfortunately ozone is toxic and so requires compressors or other methods to force the ozone into the water as ozone is not very water soluble. The upside of this is there are less chemicals used in maintaining sanitisation. Ozone kills bacterial rapidly but usually needs a little chlorine or bromine to keep working in the pool while the system is not operating. Ozone does not effect pH nor contribute to TDS (Total Dissolved Solids). Ozone gas decomposes to form oxygen and is a very effective bactericide. Dollar for dollar a pool cover is the most energy efficient product for your pool. Most of the heat your pool gains during the day is lost at night, meaning for most Sydney pools a median temperature of 18-20 degrees outside the summer peak (24-26). In leafy areas pool covers may be considered a vital addition to the pool. Pool covers insulate and trap sunlight heat as well as minimising cooling by evaporation. In times of drought or little rain the water savings can be considerable as the water will not evaporate as fast. Demand for chemicals is lessened as pool blankets shield the effects of UV degradation and chemical evaporation. Although in a Sydney summer this benefit is a little offset by the fact that warmer water requires more sanitisation (salt, chlorine, etc) to protect against algae growth in higher temperatures. Less organic load (dust, leaves etc) on the pool means less filtering time. Most pool cleaners are designed to work under a cover. Heated or not, a blanket covering on the pool will increase water temperature around 2 to 8 degrees in the average pool depending on the sun and wind exposure. An efficient way to increase your swimming season and maximise the performance of a pool heater. There are a myriad of heating products on the market; heat exchange pumps, natural gas or propane gas heaters, electric heaters and solar (panels or piping systems). How and when you use your pool will determine which of the three categories of pool heating technologies are going to fulfill your requirements for performance (speed of heating), efficiency (energy consumption vs energy output) and cost (purchase cost and operating cost). We help our customers understand, in terms of cost-per-degree-of-warming, which of these technologies will be most suitable for your new pool. Solar pool heating systems are a relatively simple concept dating back centuries. A collector on the roof of the house made of either EPDM Rubber or a PVC/TPR material, is used to collect heat from the sun. The collector can be a hollow panel, strips or tubing. Their simplicity means they have a low operating cost (typically a dedicated pump to drive water recirculation), are long life and are the most environmentally friendly option. Sizing, position (aspect to north) and exposure/location will have a great effect on the efficiency and heat gain the system will deliver to your pool. In optimum situations* solar heating can extend you comfortable swimming season up 4 or 5 months. *Australian Standard AS3634 suggests a minimum collector area equal to 60% of the surface area of the pool whilst SPASA recommends 80%. Heat pumps are highly energy efficient and operate along the same principles as a refrigerator, except in reverse. Because they ‘extract’ heat from the air it only takes one fifth of the energy to run them as they produce. I.e. A heat pump may produce 6 to 10kW of Heat energy for every 2kW it consumes. Not ideal for use with salt water pools as the salt can effect the components. 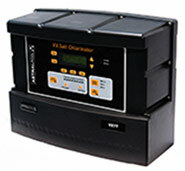 Most domestic setups can operate on single phase power. Contact us for specific information about the running costs of this system. Gas Heating. In most domestic situations gas is quickest way to heat your pool and is also common in commercial situations as its relatively inexpensive to run in comparison to electricity. The availability of natural gas and LPG has made gas heating a popular choice for swimming pool heating. Crystal can advise you on the appropriate size of heater according to how much you want your pool heated. ie maximum desired temperature. If you only use your pool on occasion it can be the most efficient as a larger heater will raise temperature rapidly, only when you need it. Tip: Installing or provisioning for a pool heating system whilst constructing a new pool is far more cost effective and less hassle that attempting to integrate it later on. The pool filter system provides locomotion to the device, sucking debris up a hose to the filter basket and pump. Commonly known by brand names such as Barracuda, Kreepy Krauly or Jetvac it’s the least expensive technology option and thus the most popular automated vacuuming apparatus, it traces a random course dependent on how the return pipe curls. Shortcoming are they sometimes miss sections of you pool like steps ledges and corners. Some models have a tendency to choke and stop moving when gum nuts and other larger leaves and debris enter the throat section so look for a big one. Another drawback is that they effectively diminish the suction of the main pump, thus increasing electricity costs and requiring your main pump and filter system to work harder. Like a suction cleaner the pool filter system provides the power, only the water is flowing (returning) from the pump instead of sucking. This high-pressure water is used to push the machine as well as push debris into a bag. Some models will create turbulence stirring up sediment in the process. It also follows a random course using a thing called the venturi effect! Good for areas with high leaf fall, some models, not all, require a booster pump making it the highest electricity user of the three types of pool cleaners. These cleaners are really underwater electric vacuum cleaners on brush-like tractor wheels. And like their land loving robot vacuum counterparts can ‘learn’ the shape of your pool. Clever huh! Some have a nifty remote control feature so you can drive them around you pool whilst supplying the sound effects yourself! Previously common in commercial situations like your local 25m learn to swim centre, they usually plug in via a transformer to convert to low voltage to run the robot. In domestic situations people need to be wary of electricity around their pool and have all necessary cut off switches and safety features in place. Electric robotic cleaners are definitely the most costly investment but provide the most thorough results as it operates independent from the pool’s main filter pump system and provides good coverage of the pools entire surface, even up to your waterline tiles in some models. Our choice in this category is the Pandora Pilot by Astral as it is fully independent and works without any suction hoses or hook up booster pumps. Works on any size pool with no installation, no supervision and with minimal maintenance the Pandora Pilot may be your perfect choice. Crystal Pools recommends the PCC2000 Cleaning & Circulation System. Keep your pool clean and healthy with a virtually invisible, automatic dirt and debris removal system. The PCC2000 system is custom engineered (through the use of CAD engineering software) specifically for your individual pool. Pop-up spray nozzles built into your pool during construction will clean steps, benches, fountains, walls and spas. These pop-up nozzles push debris from every corner of your pool to the “Patented Collection Zone”, an area that stretches across the deepest part of the pool. From here the debris is directed to the main drain and it collects in a debris containment canister, conveniently accessible at the poolside. It should be noted that an in-floor system will not collect sticks/branches and larger leaf litter. Nozzle colour can be chosen to complement any pool interior and they retract flush to the pool floor, becoming virtually undetectable when not in use. A Limited Lifetime Warranty means you won’t have to budget for a new pool cleaning system every few years. The pop-up nozzles and controlling water valve are modular, making them virtually maintenance free. PCC2000 is a systematic approach to permanent pool cleaning and circulation that will save you time and money. Returning heated and chemically treated water to the floor of the pool results in lower heat and chemical losses and provides continuous circulation. This will bring substantial saving over the life of your pool. 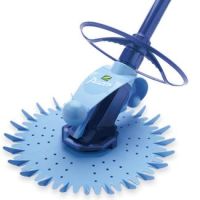 Leaf scoop, pool broom, wire brush. We recommend Aqua-quip LED flush fitting lights. All Aqua-Quip lights are Australian-made and suit all types of pools and spas. Ask us about other pool equipment and features to enhance the enjoyment of your pool. Hand rails, ladders, water slides and sluices, artificial streams and waterfalls, in-pool fountains, poolside showers, diving boards, in-pool furniture and more. Eco friendly pool equipment (filtration, heating, pumping) is a great investment as running cost savings can be substantial as well as being good for the environment. Underwater LED lighting systems have come a long way since the pool lights of yesteryear. Tip: Be aware that cheap or under-sized pool equipment can mean you spend more time on the upkeep of your pool than swimming in it.